This tutorial explains how to move or navigate from one screen to another using React Navigation 3.X Library in react native application. In a web browser, you can link to different pages using an anchor (<a>) tag. When the user clicks on a link, the URL is pushed to the browser history stack. When the user presses the back button, the browser pops the item from the top of the history stack. Similarly, React Navigation's stack navigator provides a way for your app to transition between screens and manage navigation history.React Navigation is that React Navigation's stack navigator provides the gestures and animations that you would expect on Android and iOS when navigating between routes in the stack. createStackNavigator : createStackNavigator is a function that takes a route configuration object and an options object and returns a React component. Basically here we are maintaining the route information for different screen or activity. navigation prop : The navigation prop is available to all screen components, that helps for screen navigation. this.props.navigation.navigate('RouteName') : pushes a new route to the stack navigator if it's not already in the stack, otherwise it jumps to that screen and pops the already open screen. this.props.navigation.push('RouteName') : pushes a new route to the stack navigator even if already present in the stack. this.props.navigation.goBack() : when you switch to new window using stack navigator, then it will automatically enabled the back button in header bar. (On Android, the hardware back button just works as expected.) Also you can do the same programmatically by calling the goBack() function. this.props.navigation.popToTop() : This function helps to switch back to the home or first screen of your react native application. In this example, we will create simple navigation example, where we move from one activity or screen to another on click button and vice versa. Lets see the project structure. Step-1 : Create a new react native project, if you don’t know how to create a new project in react native just follow this tutorial. NOTE : No additional steps are required for iOS. Step-5: Lets create a new component named as HomeActivity. This component will be the home screen or default screen. when user launch this application, then react native render home screen first. Add static navigationoptions object inside the class. A HomeActivity component consists of a static property called navigationOptions which is an object that returns an object that contains various configuration options. Using the static navigationoptions we can set our activity title name, color and font weight. Implement render method and return Text and Button component wrapped by root View component. When user clicks on Button, it will navigate the screen from HomeActivity to ProfileActivity. When user clicks on "Go to Profile Activity" Button, then will navigate the user to profile screen. Step-6: Lets create a new component named as ProfileActivity. This component will be the second screen. 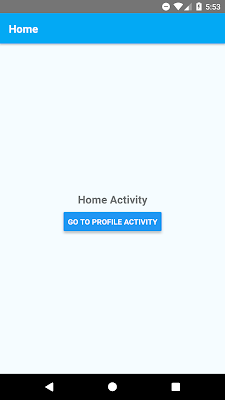 when clicks on "Go to Profile Activity" button in HomeActivity screen, then it will display the profile screen. Implement render method and return Text and Button component wrapped by root View component. When user clicks on "Go to Home Activity" Button, then will navigate the user to home screen back. Included additional import from react-navigation package. Included custom component import from HomeActivity and ProfileActivity js file. createStackNavigator is a function that returns a React component. It takes a route configuration object and, optionally, an options object (we omit this below, for now). Because the createStackNavigator function returns a React component, we can export it directly from App.js to be used as our App's root component. As you know In React Native, the component exported from App.js is the entry point (or root component) for react app and in order to get complete access or control over the component at the root of your app than you would get from exporting the result of createAppContainer, so let's export a component that just renders our AppNavigator stack navigator. 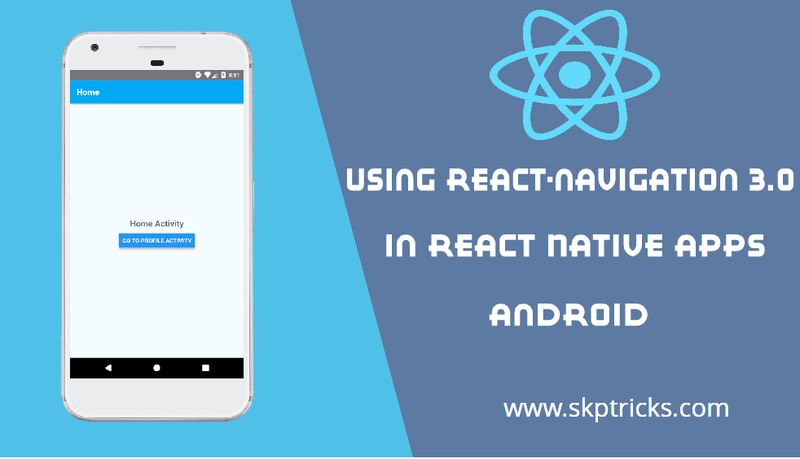 Lets see the complete source code that helps to Navigating Between Screens or Activities Using React Navigation Library in react native application. This is all about react-navigation 3.0 in React Native apps. Thank you for reading this article, and if you have any problem, have a another better useful solution about this article, please write message in the comment section. what is the navigation flow if i want to use redux in the app?